Soft14: Chromentum - An original 3D ball rolling puzzle game. Sokoban crossed with Pool. The Chromates are a cute race of strange quantum particles. They travel throughout the universe seeking intelligent life forms. They are here, and are they are studying us. Once a world develops an internet, the Chromates release Chromentum. If enough inhabitants can solve the puzzles, the Chromates will divulge the secrets of the quantum universe. Opening unimagined pathways through time and space. Play a part in the future of mankind. Play, Chromentum. 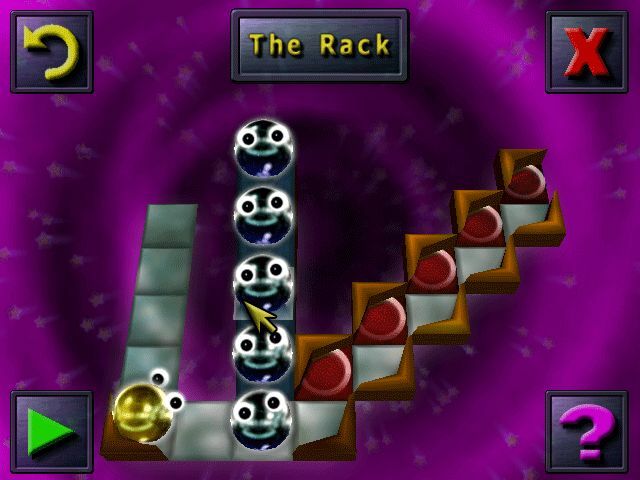 Using simple laws of physics, complete over 300 cunningly designed levels. With just two actions, move and shoot, you can manipulate the balls in a myriad of different ways setting up astounding trick shots and causing complicated chain reactions. Imagine Pool crossed with Sokoban. Chromentum features; beautiful 3D, 100% mouse controlled, full tutorial, quest levels, miniature levels, extra levels, bonus levels, 'Tipple' subgame, and a full level editor.